No sooner were the votes counted in last month’s successful repeal of Ireland’s constitutional ban on abortion, than feminists and other liberals turned their attention to a new referendum. This time the targets are removing language about blasphemy and the women’s role in the home. The referendum, likely in October, would be held alongside the presidential election – if one is called, Minister for Justice and Equality Charlie Flanagan said in a government statement. Both referendum issues are expected to cruise to easy passage with only minimal opposition. Now there is a sense that we have replaced one form of intolerance with another. Just as it was difficult to speak out against the cozy religious, social and moral consensus of 50 years ago, it is difficult to speak out against the dominant cultural mindset of today. … A new secular judgmentalism has replaced the old religious judgmentalism of yesteryear. The American Chamber of Commerce Ireland released polling data showing that that 84 percent of the Irish population believe U.S. companies are critical to the economic future. Over 155,000 Irish work for American companies. The same week as the survey release (coincidence? ), Amazon opened a 170,000-square-foot building in Dublin and announced that it will add 1,000 jobs to the 2,500 people it already employees in Ireland. Another Irish-British handshake: While not the same magnitude as the 2012 palm-to-white-gloved-palm between Martin McGuinness and the Queen, Charles, the Prince of Wales, and former IRA bomber and Sinn Féin assembly member Gerry Kelly shook right mitts in Belfast. This headline over a Derek Scally column in The Irish Times put a modern spin on an historic phrase: German’s difficulty could be Ireland’s opportunity. For the second time in as many months, Irish Ferries was forced to cancel thousands of bookings as it postponed the inaugural sailing of the WB Yeats at least until September. In case you are wondering: The impasse over restoring the Northern Ireland Assembly has reached 18 months, and debate also continues on the post-Brexit fate of the border between the North and the Republic. This entry was posted in Business & Environment, Irish America, Northern Ireland, Politics, Religion and tagged American Chamber of Commerce Ireland, border, Brexit, Northern Ireland Assembly, referendum, W. B. Yeats on June 28, 2018 by admin. President Barack Obama cited W. B. Yeats in his surprise 12 January presentation of the Medal of Freedom to Vice President Joe Biden. ” ‘Think where man’s glory most begins and ends, and say my glory was I had such friends,’ ” Obama quoted from The Municipal Gallery Revisited. This entry was posted in Arts & Culture, Irish America, Politics and tagged Barack Obama, Joe Biden, Seamus Heaney, W. B. Yeats on January 12, 2017 by admin. The poem was not published until 23 October, 1920, when it appeared in the New Statesman, launched in 1913 to give voice to the unrest of the period. In 1921, “Easter, 1916” was included in Yeats’ Michael Robartes and the Dancer. The completion date of “Easter, 1916” is unremarked in the official centennial programs of the Irish government and the National Library of Ireland. It is noted on the 1916 timeline of the Decade of Centenaries website. This entry was posted in Arts & Culture, History and tagged W. B. Yeats on September 21, 2016 by admin. I’m always happy to publish a guest post from people visiting or just returned from Ireland. I met Michael Whelan at an Irish Network-DC event earlier this year. His writing on Ireland has appeared in Irish Central and éirways magazine. His latest poetry collection is After God, an Irish Catholic American memoir available on Amazon. He sent this correspondence from Sligo. MH. So wrote W. B. Yeats in Stolen Child in the voice of the fairies luring a little one to swap him with their farie changeling. So came we under mythic Benbulbin mountain, close to Yeats’ grave, to the very waterfall of Glencar made iconic by his beloved poem. It is first stop of the first day at the Yeats International Summer School, 2016. I am among the 50 here from some dozen countries to delve deep into the world of Yeats. We range from newly graduated English majors to doctoral students and university-level teachers of literature to just plain souls who read Yeats for the fun or the challenge of it. Mostly everyone here is a poet, to some degree, as am I. Mornings at the Hawks Well theater are spent listening to world experts lecture on Yeats from every conceivable angle. This year, much attention is focused on his Easter, 1916, given the 100th anniversary of the Dublin uprising and Yeats’ conflicts with the poem. Much is fascinating, too, in the talks and illustrations on Yeats’ surreal dimension in approach to theater. 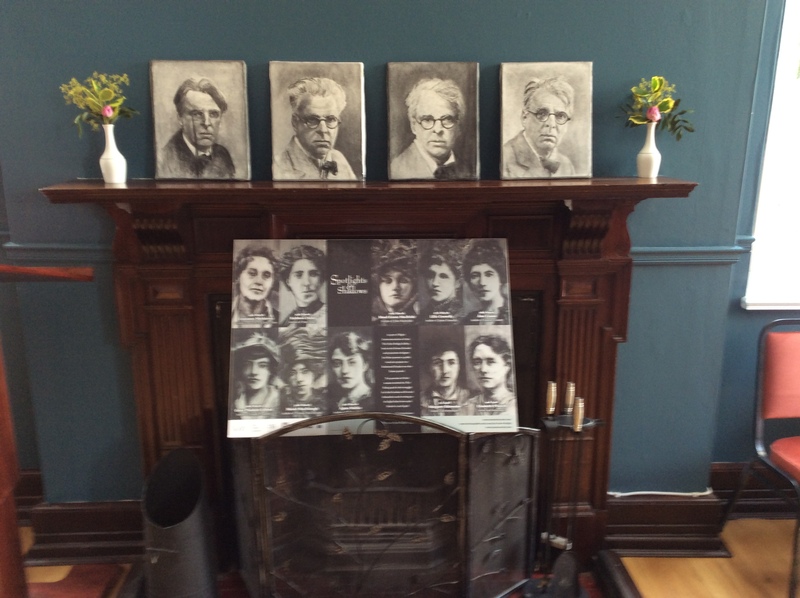 Four charcoal renderings of Yeats. Photos of women below him are the wives of leaders executed after the 1916 Rising. Afternoons are for seminars, held at the Victorian-style Yeats Society building in the center of Sligo City. You choose a topic for a week. Mine is Yeats & Heaney, a compelling class led by Dr. Rand Brandes, of Lenoir-Rhyne University. He is rich with remarkable anecdotes from his 30 years working closely with Seamus Heaney. We uncover revealing parallels and telling differences between the two poets. I come away with a sharpened eye such that I won’t read Yeats or Heaney again without drawing from the class. Another amazing experience in awaking the creative imagination comes in an intensive two-day poetry workshop by Vona Groarke, editor of the Poetry Ireland Review. It’s not just what happens in class that makes the summer school experience. It’s the everywhere-around spell of Yeats that still hypnotizes all of Sligo. Here everything is just around the corner from everything else — creating the feel you are walking the buzzing streets as in a stage set for the likes of Yeats theater, the wild river rushing under the bridge next to the Yeats Society building and the sky flipping theatrically, constantly–Irishly–between showers and sunny spots. 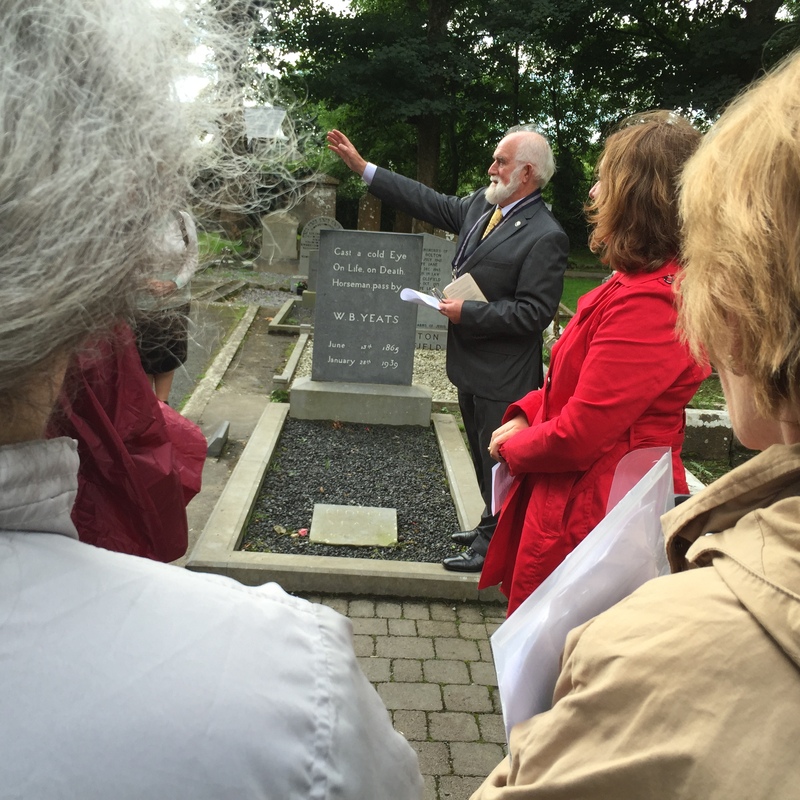 Summer School participants visit grave of Yeats in Drumcliff churchyard, at foot of Benbulbin mountain. This entry was posted in Arts & Culture and tagged Michael Whelan, Seamus Heaney, Sligo, W. B. Yeats on August 6, 2016 by admin.